Guest Cabin - Enjoy visiting Montana - wonderful mountain views. In winter you can ski from the front porch to the Bigfork Nordic ski trails that are just across the road. In summer you can hike on the Jewel Basin hiking trails. Cabin is located just one mile from the Jewel Basin Road that leads to the trails. This cabin is designed for 2 guests with bunk beds, there is also a couch that makes into a bed that will accommodate 1 more. Fully equipped kitchen and bath. All linens, towels and cooking equipment are included. Wildlife can be viewed from the porch. Great bicycling area. This is a perfect location for either cross-country skiing or hiking on the many Jewel Basin trails. You can ride a bike or drive to Echo Lake in just minutes. Just a 10 minute drive to Bigfork village with its many galleries, shops, restaurants and live theater. Directions: From Glacier Park International Airport in Kalispell - drive south on Highway 2 to the intersection at Highway 35 in center of town. Turn east (left) on Highway 35 and drive to the Junction of Highway 206, just past that intersection turn left on Lake Blaine Road. continue on Lake Blaine which turns to Foothill Road. The address is 4216 Foothill Road. 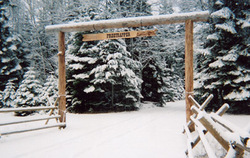 There is a large 'Freetrapper' sign on the arch in the driveway.